Need a comedian for your upcoming event? You've come to the right place. 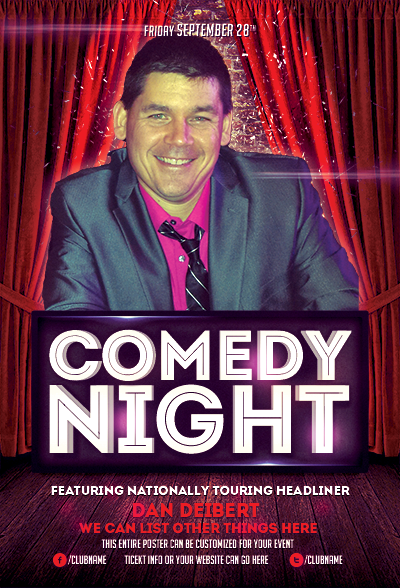 Dan Deibert is a professional comedian with over 25 years of experience. His act is perfect for your next event because it's humor for adults, without being too "adult". Feel free to bounce around the site to have your questions answered. When you are ready, fill out the booking form below or over at the booking page. 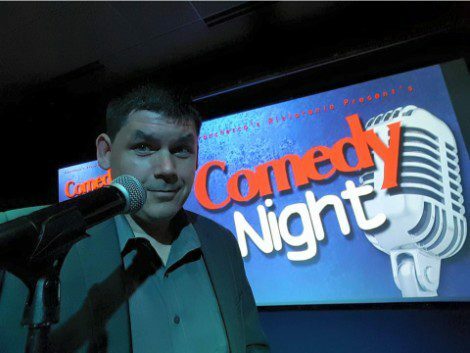 Dan has been performing stand up comedy for over 25 years and is one of the most frequently booked corporate comedians in the Upper Midwest. He's made numerous appearances both as a comedian and host on network TV and has hosted radio shows in Chicago, Milwaukee, St. Louis, and even a nationally syndicated show heard on over 100 radio stations across the county. With a clean act that works in both comedy clubs and the corporate setting, Dan deals with drunks, drug stores, and driving. Much of his material is based on marriage and family life. It's material we can all relate to. Dan arrived at Hotel Grinnell the night before his performance, in the middle of a snowstorm. During his stay, he did his homework. He got to know the hotel and ballroom (where he performed), talked with guests and staff, and walked around town the next day. As a result, he gave a performance that resonated with the audience, kept them engaged and laughing, and inspired participation! Dan was on his game the entire hour, plus! He was very well received and gets a grade of A+ from Hotel Grinnell. We contacted Dan a couple of months prior to our event and couldn't have been more pleased with his comments and suggestions for our event. This was our first time organizing this type of event and we knew what we kind of wanted and Dan made sure we got everything we wanted at a price we thought we could afford. Dan Deibert was fantastic! He had the crowd engaged and laughing and crying at the same time. We had a photographer there from a local paper who ended up staying for the entire event because she was enjoying herself so much. The work with Dan Deibert was excellent. We were looking for something different for our awards banquet and we found it. Mr. Deibert had everyone rolling in their seats. One of our member's husbands stated that his wife never laughs and the program made her do it. Everyone is stating how excellent it was. Hi Dan! I’ve had numerous people tell me that this year’s holiday party was the best we have had in years thanks in part to you! Everyone had a great time, you were able to connect to multiple people and create a fun evening. We appreciated your entertainment and was great comic relief from the hustle and bustle of our day to day lives. Attendees said they could have listened to you for hours on end. We hired Dan for a company outing. Dan was hilarious and had everyone laughing throughout his entire performance. I received multiple compliments for him after the show, and many asked “where did you find him?”. Dan was very professional throughout the whole process of setting up the event and finalizing the booking. I would for sure have him again at another outing, and would definitely recommend him to a friend! Mr. Deibert was excellent in communicating with us before the event. He was accommodating to our schedule and was well received by the audience. We had a group of 250 and his performance was able to relate to the entire crowd and kept us all entertained the entire set. I have had numerous comments that this was the best event that we have had in over 15 years. We own a local Movie Theatre, but decided to try some live acts.. and went with comedy first. Dan was our first comedy act and such a success that as the crowd exited the theater, they wanted to know when we would bring them back. I’m happy to say… we plan to bring Dan Back soon. Thank you Dan for a terrific performance at our Chamber Annual Meeting. Your performance brought tears to many peoples’ eyes as we were laughing so hard! You are one that the audience will definitely remember! Thanks again for being so easy to work with. I would love to help make your next event a success. To get started with a quote, I just need a little information from you. If you don't have all of the details below, that is fine. Just let me know what you know and I'll get back to you within one business day.